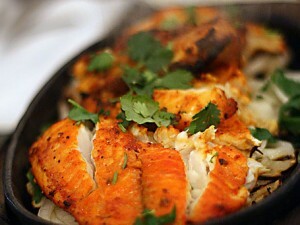 Fish Tandoori recipe by Mariam at DesiRecipes.com. Mix all ingredients together and store. After cleaning the fish, make slanting gashes on the fish on each side.Do this in such a way that the fish remains a whole. Marinate the fish in the combined masala for about 4 hours. Prepare a baking dish and brush the bottom of the dish with a little oil. Carefully place the fish in the center of the dish and brush with some oil on top. Pour any remaning marinade into the dish and bake in a moderate oven at 375 deg F till the fish is done and becomes golden brown at the top. Serve garnished with coriander leaves and lemon wedges. Since I like sea food I understand that it will be good dish.